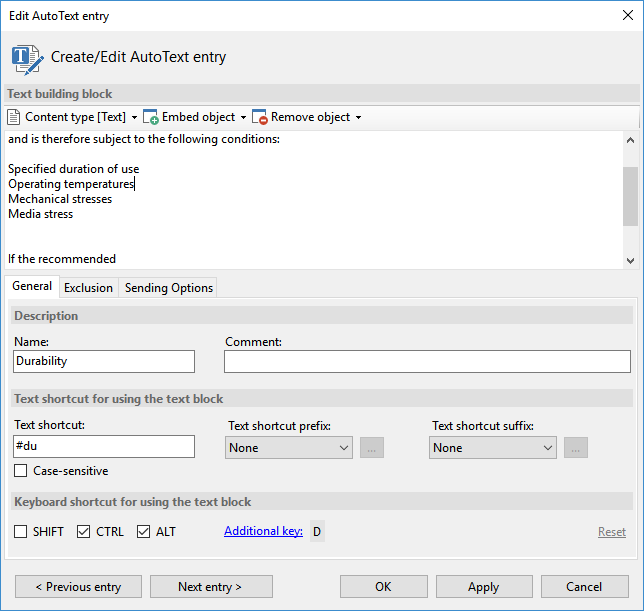 With AutoText Master, AutoTexts or text blocks can clearly be organized in various catalog files and groups and be used by a keyboard shortcut or a text shortcut in a variety of applications. Groups can be displayed as selection menu in any application to make it easier to access the contained AutoText entries. The program also enables the sharing of a catalog by using a database server or by synchronizing a shared folder (for example via Dropbox). Furthermore can be determined, whether the output of a text block should be triggered by a keyboard shortcut or a text shortcut. By supporting different font colors as well as embedded images, HTML and RTF formatted AutoTexts are suitable, for example for the use of different signatures in Outlook. Furthermore, it is conceivable to use a text block with mixed content in Word or equally any RTF editor such as WordPad. 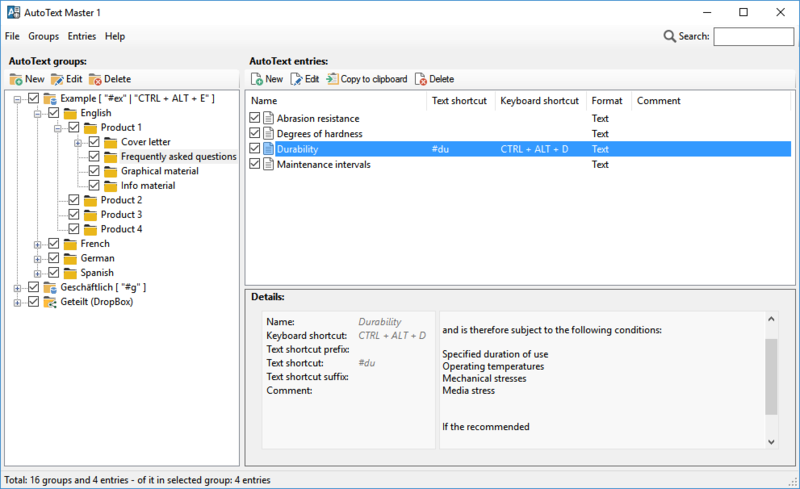 For whom is AutoText Master suitable? AutoText Master is aimed at users who have to write a lot every day and want to optimize this process as much as possible, to gain time for other tasks. The typical purpose of the program is the support for writing reports or business letters, creating documentations and replying to emails. There are also a large number of individual applications for text modules, such as correcting frequent typos in a particular word or the use of pick lists, for example to allow access to an address or the like with one keystroke. Each text module, once set up, saves more and more time in the future and facilitates the work. The use of a text block can be limited by filters to prevent unwanted output. For this, the window title and the path of the currently active application can be used. Furthermore, it is advisable to put a special character such as the pound symbol before a text shortcut to prevent that an insertion of a text block is triggered, only because the abbreviation was part of the word entered. In many cases, only a few data change within common output text blocks, such as address, date or amount. Then it makes sense to allow data entry via a mask in order to ensure, for example, correct spelling or formatting. Using text blocks can save you among other things, a possible lookup for data in an earlier document. 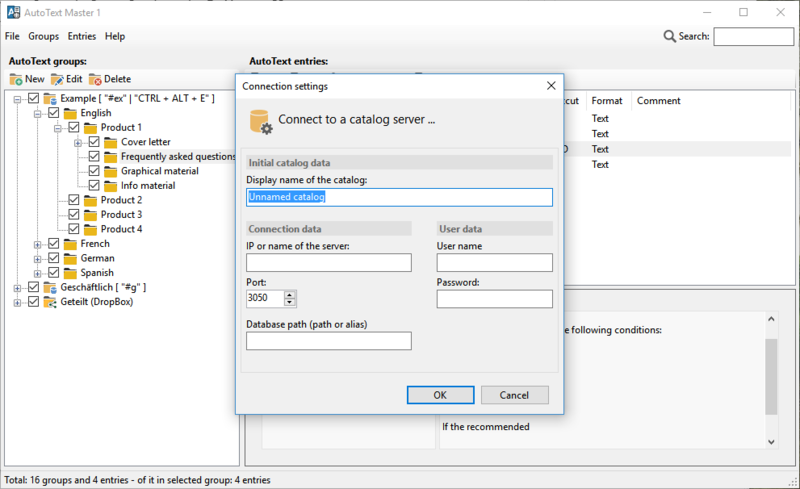 AutoText Master supports the sharing of a catalog. For this, there are two options available: Firstly, the use of a database server that can be accessed via network from all workstations and secondly, the sharing of a catalog using a special folder that is synchronized by Dropbox & Co. Thus, version conflicts such as the use of outdated templates at some places can be avoided. New text blocks can be deployed centralized in one place and, if necessary, exclusively by an authorized person.